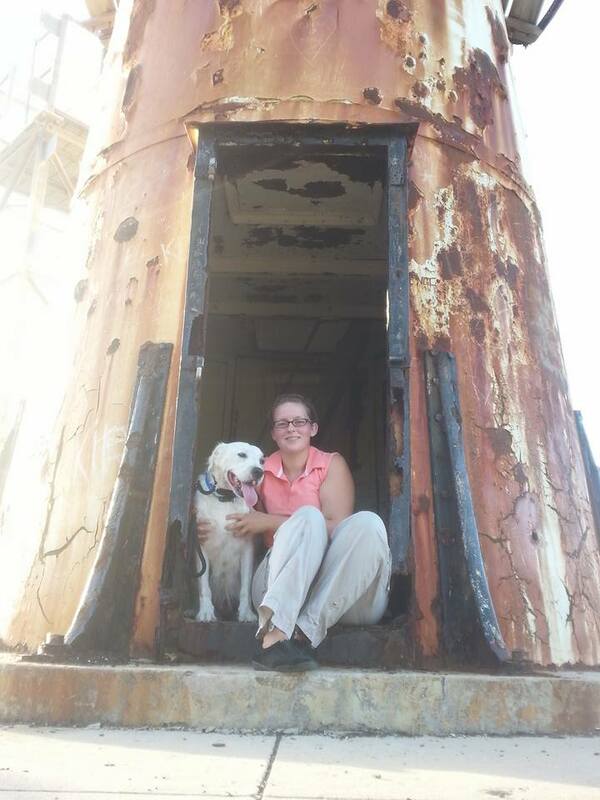 Juno’s first hike, at Ham’s Bluff Lighthouse. Though still mourning the loss of our beloved Edwin, this week we welcomed a new member into the family. 7-year-old Juno was in desperate need of a home as her elderly owner recently had to relocate for health reasons, and she’s such a sweet dog that I just couldn’t say “no”! She’s already had her first hike, first outing to Polly’s (coffee for me, lots of attention for her), and first trip to the beach, where she drank a worrying amount of sea-water, but otherwise had a great time. She’s a great dog and I’m so glad that I took the chance to meet her – even though I wasn’t planning to adopt again so soon. 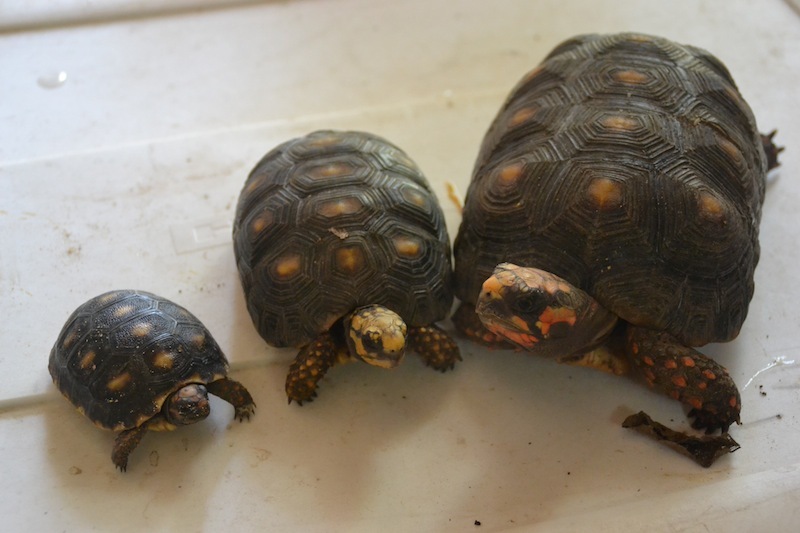 Tortii 1 (1 of 3, 1 month old), Bertha (1 year old), and Mrs Edwards-Plaskett (2-3 years old). Back to tortoises now. 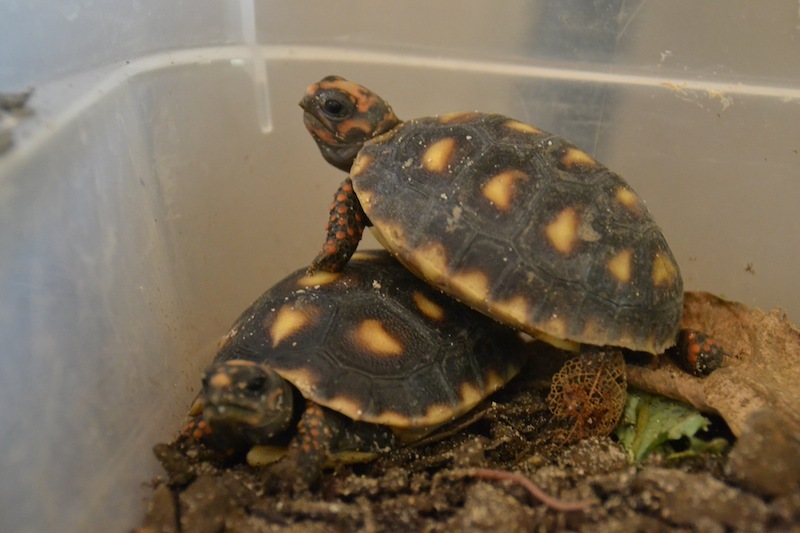 We’ve been keeping a group of adult Red-Footed Tortoises for about 8 years now, and have had a number of successful hatchings over the years. Most of the hatchlings have been given to friends to raise, but I currently have one from last summer and three from this summer. Currently we have tortoises ranging from 1 month to 10+ years old. 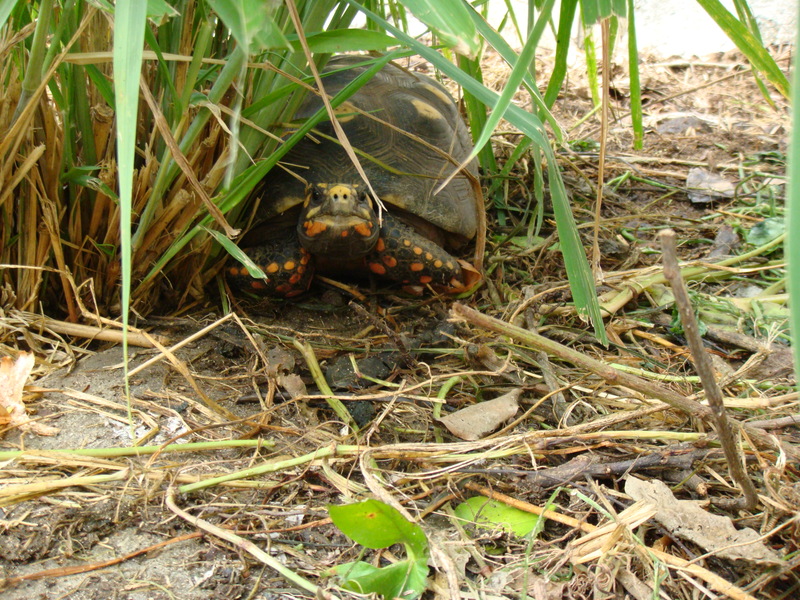 Red-footed Tortoises are found in the wild on St Croix, but are commonly lost to cars, dogs, cats, mongoose, birds, and rats, particularly during the first year (when they are still “bite-size”). They are mostly found in the “rainforest” area of the island, and occasionally the North Shore. At hatching they are about 2″ long, with shells that harden in the first week. They can grow up to 2′ long, and have been know to live for over 50 years! The eggs are laid in a shallow hole in soft ground, with an average clutch of 3-5 2″ round white eggs. Eggs can take 3-6 months to hatch, with a variance of several months within a single clutch. I often get questions about what to do when someone finds a tortoise. If it’s a good-sized adult, with no injuries, help it across the road (since that’s where you usually see them) and go on with your day. 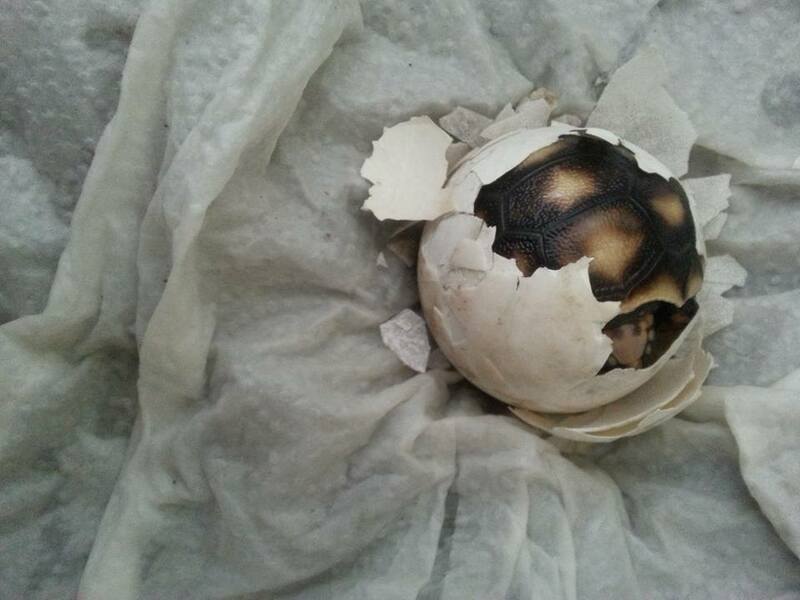 If you’re lucky enough to find a young hatchling, or if you find an injured adolescent or adult, you may decide to take it home with you until it is grown or fully rehabilitated. Tortoises will climb! Make sure your pen has high enough walls. A suitable habitat for young hatchlings. 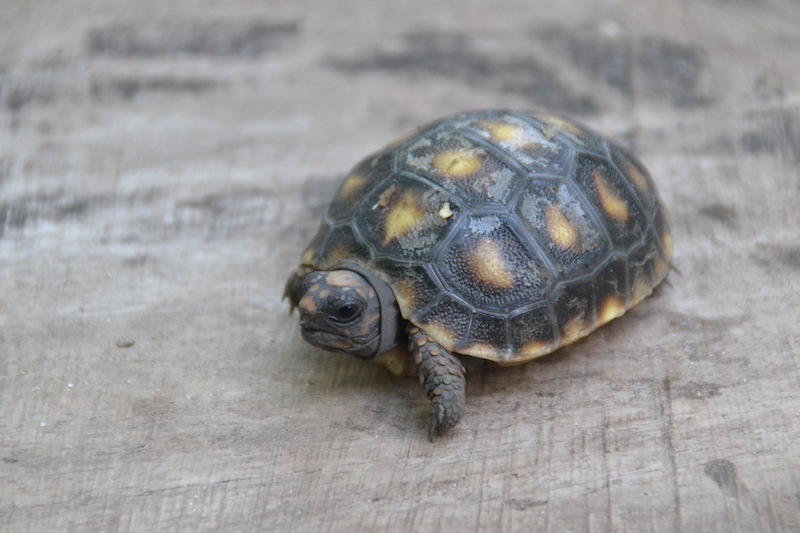 Housing requirements for adult red-footed tortoises are simple: a securely fenced or bricked-in enclosure at least 12″ high with appropriate drainage and a low roofed section or pile of small branches, coconut bracts, and large leaves in which to “burrow”. A floor of 4-6″ of dirt is preferable, so that adult females may easily dig appropriate “nests” in which to lay their eggs. 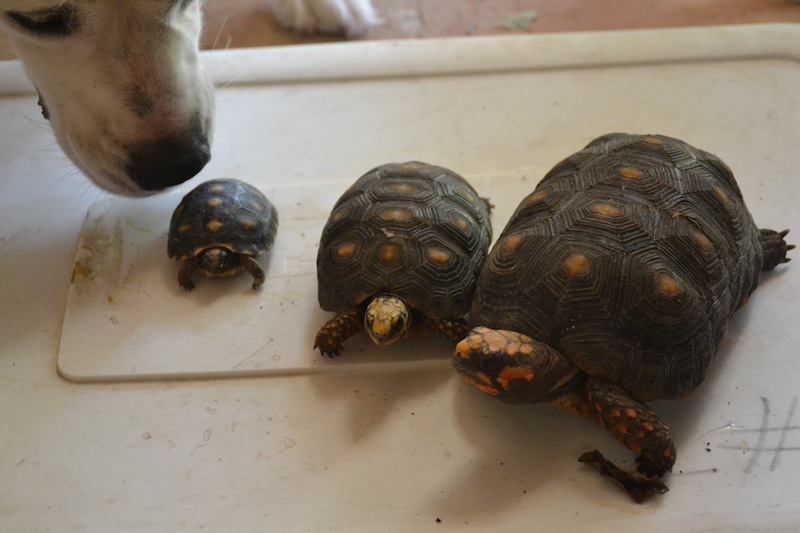 Tortoises under about 5″ long will be at risk from dogs, birds, mongoose, and rats, so should be kept indoors or in a raised enclosure with both a floor and a wire roof (I favor a pen with half a solid roof and half a chicken-mesh roof, so that they may sun themselves, or seek the cooler shaded portion). A standard “under-bed” plastic crate is fine for 1-3 hatchlings for the first few months if kept indoors. I like to add leaf-litter (ant-free! ), soil, and a few flat stones so that they have an “environment” – this will need to be replaced every couple of weeks as it starts to smell. Adults will eat their own waste, so they require little cleaning if kept in a large enough enclosure. Feeding requirements are much the same throughout a tortoise’s life cycle. They require a large amount of edible vegetation for optimal digestion, with a small amount of supplemental protein in the form of dry cat, dog, or livestock feed. They will also eat most non-meat kitchen scraps, particularly as adults. Vegetation can include household scraps, lettuce, spinach, kale, wandering jew, nonii leaves, kudzu, garden weeds, fallen or spoiling fruit, and hibiscus leaves. Hibiscus flowers are a favorite, just be sure that your plants have not been treated with any pesticides. Additional protein should not be fed more than twice weekly, as it can promote over-growth of the shell. Vegetation should be fed every day, with any excess being removed frequently so as to not attract insects and potential predators. Over time you’ll figure out how much your tortoises need each day – more in summer when they are most active. As with anything, a varied diet where they get to pick and choose will be the most natural and healthy. Water. 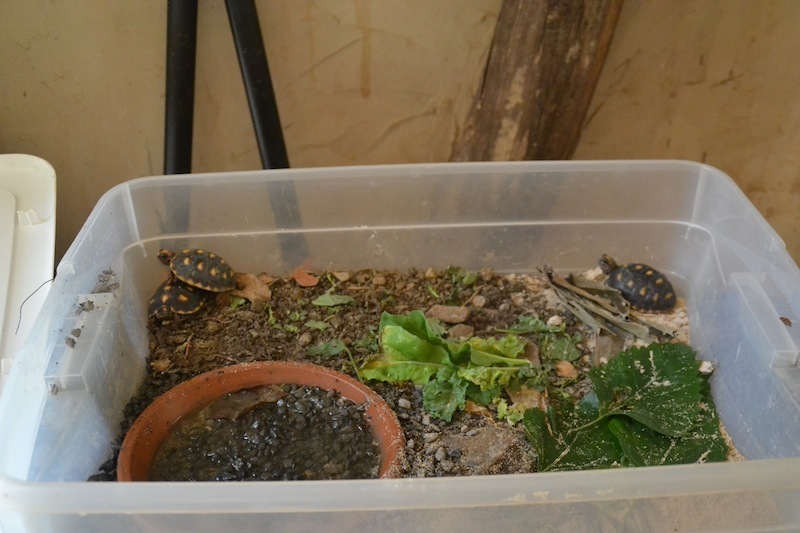 At all stages of life, red-footed tortoises need access to a shallow dish of fresh, clean water, large enough to soak in, but shallow enough that they cannot drown, and can get in and out easily. 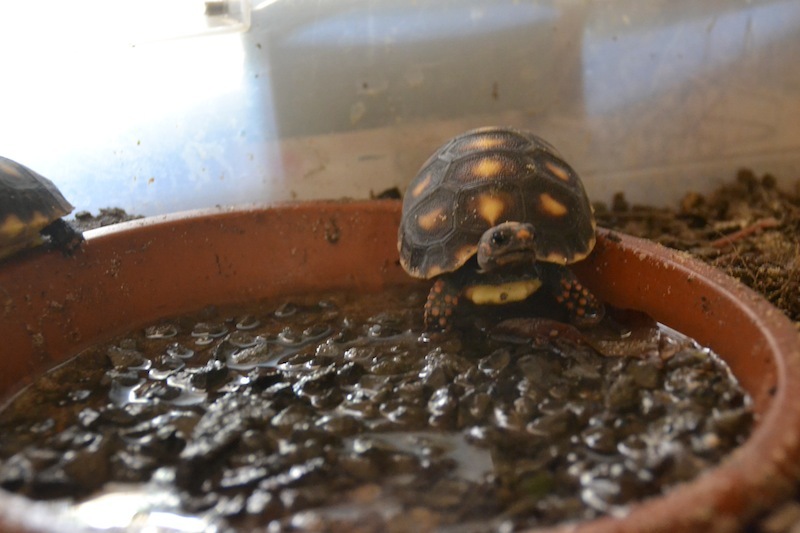 For hatchlings, I like to use an 8″ clay plant pot saucer with a generous handful of washed gravel in the bottom. This gets about 1/4″ of water over the gravel, so that they may safely soak and drink. The gravel provides traction and makes it shallow enough for them to climb over the edge. For adolescents and adults, a larger plastic plant saucer or other shallow tray works fine – they can safely have 1/2-1″ of water. An actively mating group of red-footed tortoises will generally consist of at least 1 adult female and 2 adult males. With fewer than 2 males mating in less likely as they are highly competitive! I generally try to keep at least 4 adults as a “herd” in order to have a good chance of at least one clutch per year, and less fighting between the males. Adult males will try to roll each other over, so make sure no one is stuck on his back at feeding time! Hatchlings will sometimes fall over by accident, and generally can’t right themselves. Adult males have a “waist” or narrower middle to their shell, allowing themselves to (usually) turn back over. Generally an adult female will lay 1-2 clutches per year, and may dig a number of holes before actually laying. We’ve had most of our hatchings in mid-summer. Mongoose frequently dig up and eat the eggs, so I’ve started to relocate nests that I find into a 5 gallon plant pot with loose, stony soil, covered with a metal bucket, and left in the same location as the nest was. Females will not monitor the nests after they are laid and covered. Hatching. It takes 2-3 days for a tortoise to break free from its egg. Do not disturb or try to speed up this process, though you may add a piece of damp papertowel to its environment to keep the humidity high. After exiting the egg, it takes several days for the remaining yolk sac to be absorbed into the abdomen – do not handle the hatchling during this time as a ruptured yolk sac can be fatal. It will take about a week for the hatchling’s shell to harden and the underside to close up where the yolk sac was. The “egg tooth” on the hatchling’s upper jaw will remain apparent for 1-2 months. For a complete photo essay on the hatching process, see my previous post “A Grand Entrance“. Tortoises as pets. Keep in mind that these tortoises can live nearly as long as you! While they are adorable as hatchlings, they do become quite large and quite boring. So either be prepared to care for a tortoise for a very very long time, or try to make it’s habitat as natural as possible as it grows, so that your tortoise will have the skills to survive when you release it as an adult. This means feeding it local flora, letting it “burrow”, encouraging “foraging” (don’t always feed it in the same place), and giving it as large an enclosure as possible. Please remember that red-footed tortoises are the only local tortoise – do not release other species or any other non-local exotic pets! If you have any other questions related to the care and keeping of red-footed tortoises, please comment below! Our Nidulari special this week is a wood-fired Artisan Herb Boule for $10, limited supply so please order ahead. Hope to see you at the farmstead this Wednesday 2:30-6:30pm!